Effie Trinket’s Capitol fashion may soon be available at your local drugstore. Covergirl is teaming up with The Hunger Games: Catching Fire to bring bold, fantasy fashion to every day consumers. The Capitol Collection of beauty products will be a “first of it’s kind” for Covergirl. Fans of the books are most likely saying, “no way do I want to resemble Effie Trinket.” The products included in the line have yet to be announced. We can imagine they will include vibrant eye shadow, outrageous fake eyelashes and bright lipsticks. Here’s the thing, these will be beautiful products but the world of the Capitol is meant to be full plastic surgery, ridiculous fashion, and satire. The people of the Capitol were not “exquisite” or beautiful. 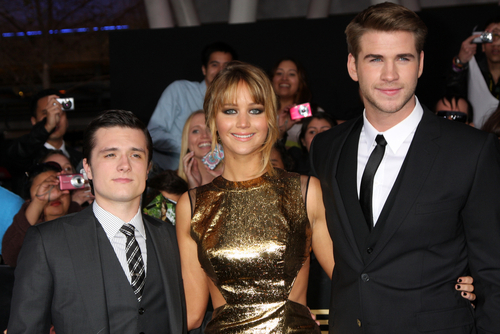 Lionsgate partnered with China Glaze nail products last year for the opening of The Hunger Games. They created a stunning line of nail polishes, ranging from fiery sparkles to matte charcoal to twinkling neutrals. The line was inspired by the twelve districts and characters from The Hunger Games. I predict that the nail polishes will have done better for Lionsgate than eye shadow.